Paruna community caravan park = $10 powered or unpowered - bargain! 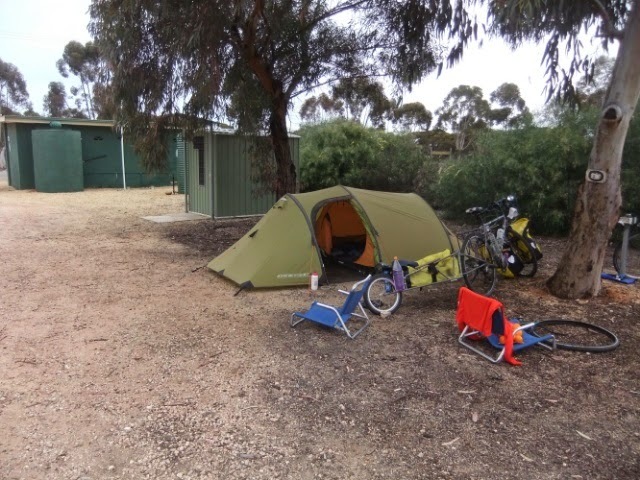 This is our 6th cycle day since Port Augusta and we are both finding the legs are fine and are not lethargic or fatigue yet. We will go one more day to Pinnaroo as the winds albeit light will be slightly behind us tomorrow. Today we woke and it was about 1 degree and a little cold. Each morning now the tent fly has condensation on it and usually picks up whatever is on the ground - gravel or sand when we pack it up and each day we have to put it up and let it dry and then brush the inside off whether it be gravel or sand ... I hate camping on any of those especially when the tent gets condensation. I have decided that I can't go any further with the clothes I have ... I sent home my long sleeve t shirt when at Mt Isa thinking that I don't really need it but today I decided that nope I am going to the op shop at Loxton (where we will pick up food) to find a thin long sleeve shirt to wear under my woollen jumper instead of my thermal which is quite stinky at the moment as I have worn it for the past week in both cycling and after cycling! poooooh stink! 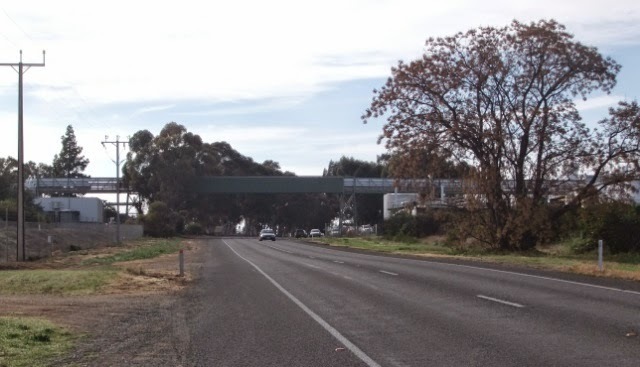 We were quite excited that we would only be on the Sturt highway for a few kms and then we would be leaving the traffic behind ... well that excitement was short lived as the damn traffic came with us to Berri and continued on to Loxton with us! Although it was mainly car traffic and very little truck traffic. We had a shoulder to ride in but again it was rough riding. 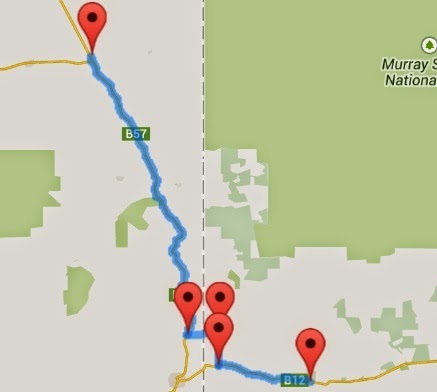 It took us a long time to get to Loxton as it was very stop start and hard to get a rhythm going as you have to stop for traffic, slow down with all the rough road in the shoulder. Just before getting to Berri you are surrounded by vineyards and the occassional orange farm. Berri has the massive Berri Estates which is where they make wine and I tell you this is NOT your small time boutique wine ... 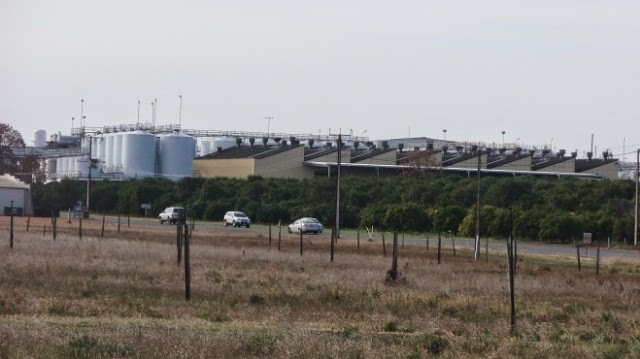 I couldn't believe the volume of vats that this factory had ... so many that they had a factory on each side of the road and believe it or not it is linked by a series of pipes that run across the road ... at first I thought it was a walkover but it is not - it is pipes for the wine! 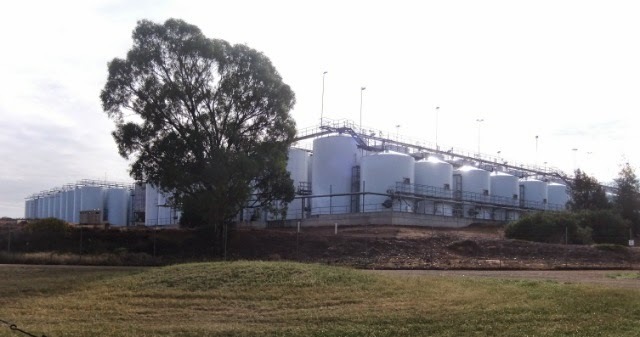 the first photo is one side of the road with vats and the factory (assuming for the bottling or putting it in wine bladders and then in a box!). The second photo is the majority of the vats on the other side of the road and the third photo is the series of pipes that runs between the 2 parts of the factory! The road from Berri to Loxton is just as busy but we had no problems - there is a short sharp hill just out of Berri after you go over the Gurra Gurra flood plains. Even cars were struggling to get up this hill! It is up and down to Loxton - not hard but rolling. Just before Loxton we bought a bag of navel oranges for $2 - it is about 2kg worth and they are very sweet and lovely. Loxton is a nice town, didn't see much there as we just stopped at the town center for a cuppa and to food shop (has a small woolies there as well as a farmland and an IGA. I managed to get a long sleeve shirt and it is nice to wear under the woollen jumper. From Loxton we left and headed for Pinnaroo along the Browns Well highway - it has been soooooo loooooooong since we have been on a road that is just us and very little traffic. It was wonderful riding, very rolling but that didn't matter. 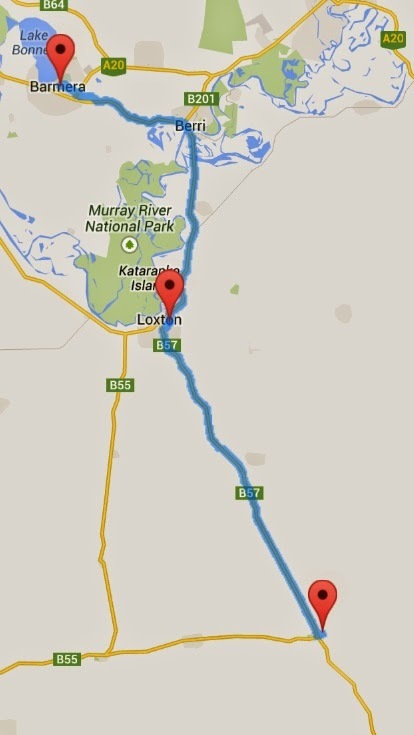 It is 34km to Paruna from Loxton and we arrived about 2.30pm. It has a tower but the internet is very slow and takes ages to upload photos so this is why I have waited until we get to our next camp spot. Tomorrow there is suppose to be a chance of a shower so we are hoping it holds off until we are somewhere along the road. 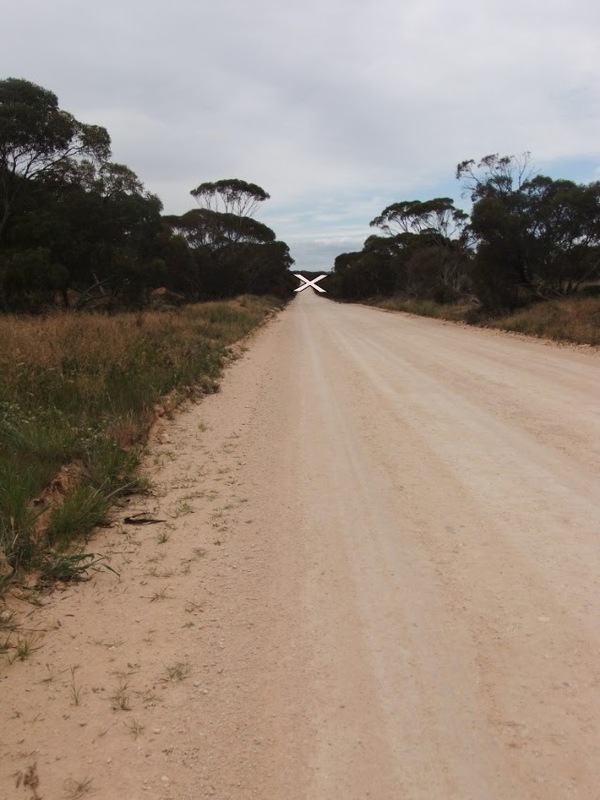 We stay on this road to Pinnaroo where we will join the Mallee highway and head east. It looks like it is going to rain today so we managed to check the radar before loosing reception and the radio also confirmed that there maybe showers but it looks like the bulk of it will be dumped on the ranges east of Adelaide and if any showers did come it maybe late afternoon. so while I made brekky Neil packed up the tent and his trailer - the park had a table under a shelter hence why Neil could pack up his trailer as usually that is our table! We were off to an early start at 7.30am, it wasn't spitting but just constant drops were failling that eventually everything got damp (not soaking or wet just damp!) this morning is a little cool and because we were wearing our coats we began to sweat so that made us cold. Riding along it is the same as yesterday - rolling. Not a breath of wind today which is probably our very first day without any wind (it was forecasted as a cross tailwind but no wind is better than a headwind!). just after that at about 6km we turned right for another 6km to the highway, beleive it or not but just as we crossed into Victoria the sun peeked out from the clouds and stayed there for the rest of the ride (another 24km to Murrayville). Neil was very happy when we crossed the imaginary border and is happy to be back in Victoria. We got to Murrayville at around 2.30pm very tired and weary. Even Kouta is feeling it - today is our 7th day straight riding and we have covered about 609km in 7 days since leaving Port Augusta. So tomorrow is a rest day for all of us to recover and to prepare ourselves for Geelongs finals match against Hawthorn ... go cats! At the rate you are going, you will be home before us! Go Cats. Hope it is a good game. No chance of us seeing it, but will keep up with scores on the net. Take care.